Jo joined us in January 2014 as a receptionist/book-keeper. 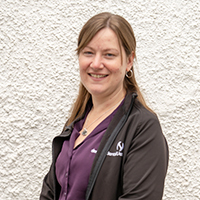 She spent nine years with a Midlothian veterinary practice and, during that spell, qualified as a Veterinary Nurse in 1999 from Edinburgh's Telford College. After working ultimately as head nurse and practice administrator, she changed career and joined the computer company Veterinary Solutions in 2005 on the support team for practice management systems. She also obtained certificates from the Institute of Certified Bookkeepers in 2009. However, she missed daily contact with animals and their owners so decided to move back into veterinary practice. She became reception manager in 2017 and practice manager in 2018. She lives locally with her young family and dogs.